(4:02 p.m. EDT) -- With Breakaway less than a year away and Getaway running ahead of schedule, Norwegian Cruise Line (formerly known as NCL) has announced it is building a third new ship, due for delivery in October 2015. The ship, codenamed Breakaway Plus, will be larger than Norwegian Breakaway and Norwegian Getaway, coming in at 163,000-gross tons and housing 4,200 passengers. Once completed, it will be the largest ship in Norwegian's fleet. Breakaway Plus will be built at Meyer Werft GMBH shipyard in Germany, where both Breakaway-class ships are under construction. The cruise line's four Jewel-class ships also were built at Meyer Werft. Norwegian also is maintaining the option for a fourth ship, for delivery in spring 2017. “Norwegian Breakaway and Norwegian Getaway have garnered significant attention in the marketplace with their innovative design, rich stateroom mix and world-class amenities," Kevin Sheehan, Norwegian's president and CEO said. "Building on that momentum … we are extending the excitement and anticipation with a new, larger edition Breakaway Plus class ship to further distinguish the Norwegian brand." 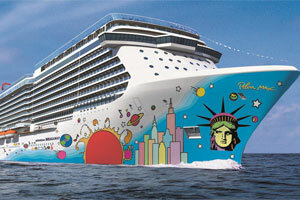 The 4,000-passenger Norwegian Breakaway is scheduled for delivery in April 2013.